Imagine the excitement when you bring home that brand new big screen – your friends and family gathered around your new TV to watch all the home-team action or the latest box-office hit! 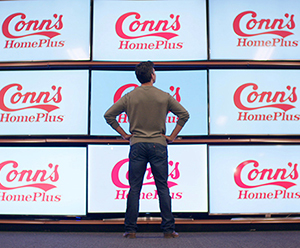 From 4K TVs to QLED TVs to OLED TVs and the rest, Conn’s HomePlus makes it easy for you to get the TV you want and take it home that same day. Learn more about our latest TV and electronics financing deals.&nbsp&nbsp Learn more in our TV Buying Guide. These days, shopping for a new-and-improved TV is no easy task. With such a wide range of features, options and prices, it can be hard to figure out which TV is best for your home. That’s why we put together this handy TV Buying Guide to educate shoppers about all the latest specs and features, including TV types, sizes, resolution, refresh rate, advanced features and accessories. Learn about the differences between the main types of TVs, OLED, LED and LCD TVs, as well as TV resolution, including 4K, HDR, Full HD and HD TVs. 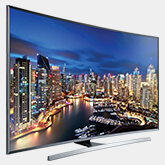 Get clear on the latest advances in TV technology, from Smart TVs to Curved TVs to Super Ultra HD TVs. Finally, see an overview of the most common TV accessories to enhance your viewing experience, including home theater systems, streaming media players and HDMI cables. You’ll find answers to all your questions about the latest TVs in our TV Buying Guide. The average American adult spends more than five hours a day watching TV. If you’re spending that much time enjoying your favorite shows, movies and sporting events, you want to make sure you’re getting an awesome TV picture. 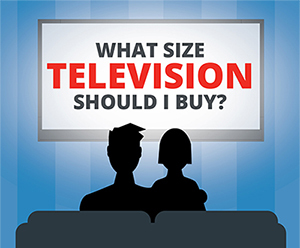 If you’re not sure what size TV you should buy, check out our guide to TV size, viewing distance and resolution, three key factors that determine picture quality.